I am please to announce that i have taken the Open HPI course and passed the quizzes + Final Exam and rewarded with ‘Record of Achievement’ . openHPI is a platform for massive open online courses (MOOC) in the field of computer science and information technology. It is hosted at the Hasso Plattner Institute (HPI) in Potsdam, Germany. openHPI is open for everyone, participation is free of costs. Everybody can register and enroll for courses without any prerequisites. openHPI’s courses are derived from HPI’s bachelor and master programs in IT-Systems Engineering and cover both, foundations of information technology as well as highly topical innovations. 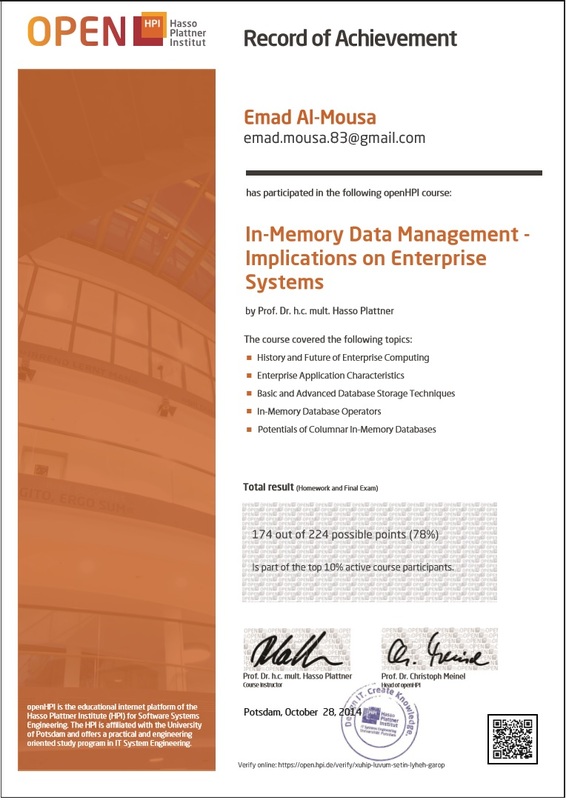 The Course was taught by Prof. Hasso Plattner ( He is the Co-founder of SAP-AG Company and currently Chairman of the company), he is the person who envisioned SAP HANA and saw the importance of in-memory database in Enterprise Systems. He is an AMAZING pioneer & very well in teaching !! The Course is amazing and beneficial for DBA’s, IT Professionals, Project Managers, Enterprise System Architects.